Please complete and submit this form to order individual organ donation promotional items or packs of the material. On receipt of your order we will inform you when you can expect delivery of your items. * 14. Please leave any comments here about delivery or anything else about your order. 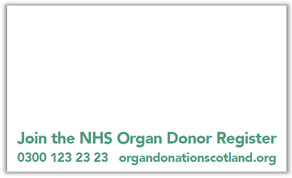 If you need further information or would like to discuss specific order requests, please contact us on 0131 244 2995 or email Organ_Donation_Scotland@gov.scot and we will try and assist.